You may not have put much thought into why you use the cutting board that you have. It’s only there as a way to protect your countertops anyway, right? Wrong! If you are not already using a wooden cutting board, you should be. Let us tell you about the benefits of using a wooden cutting board. First off, wood is more gentle on your knife blades. With a wooden cutting board, cutting or chopping vegetables will not wear down your knife’s sharpness. So, a wooden cutting board is a smart investment as it will increase the longevity of your cutlery. With plastic cutting boards, you can easily notice its age by not only the wear and tear but also by the discoloration. Plastic cutting boards stain over time, and those cuts and gashes in plastic create a thriving home for bacteria. Cleaning your wooden cutting board can be easy, too. After use, you should scrub your cutting board with hot soapy water, rinse it clean, and dry it with a cloth. The United States Department of Agriculture also recommends using one cutting board for fresh produce and bread and a separate one for raw meat, poultry, and seafood, to avoid cross-contamination. Your wooden cutting board will also develop plenty of character over time. 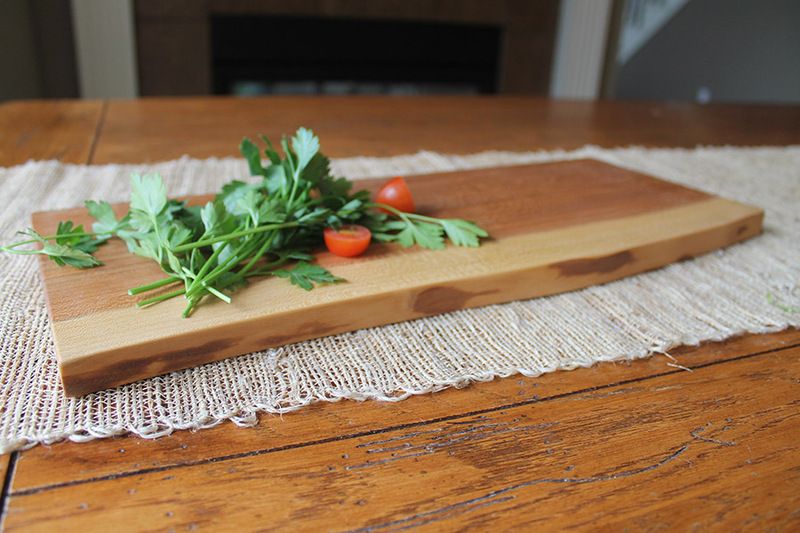 Knife marks and other nicks in the wood are good ways to show off the sturdiness and longevity of your cutting board. Are you done cutting your meats and cheeses? Then put away your cutting board and look for one of our clean and beautiful wooden serving boards or wooden plates. Impress your guests with a stylish way to display appetizers. Best of all, like most of our products, you can customize your wooden cutting board to add a personalized touch. Be confident that any bowl, board, utensil, and everything else available from Holland Bowl Mill will look amazing and last a lifetime. Visit our showroom at 120 James Street in Holland to see all of our products, or call us at (616) 396-6513 to place your order. You can also follow us on Facebook and Instagram to see updates on everything else we have to offer.